Asian Machine Tool Corporation Pvt. 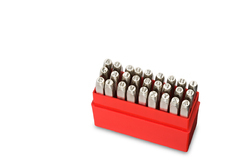 Ltd.
We are a leading Wholesale Trader of dot stress hand punch, hand held marking punch, interchangeable steel type hand punches, numeric punches, dot stress numeric punch and alphabet marking from Pune, India. 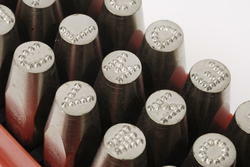 We are offering Dot Stress Hand Punch to our clients. Available in two character styles, continuous line or dot formation. 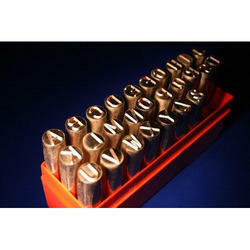 We are offering Hand Held Marking Punch. Manufactured from quality controlled Chromium steel allied to precise heat treatment, giving maximum safety in use, long product life and value for money. Can be used without fear of breakage or premature character wear. 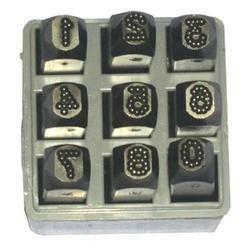 Punch Sets packed in strong plastic boxes with separate compartments for each stamp, to allow rapid selection. Safety note - we recommend use of safety goggles and safety grips when using striking tools. 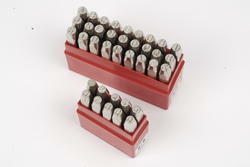 We are offering Interchangeable Steel Type Hand Punches to our clients. Clear character styles for a quality mark Hardened to 59-63 Rockwell C to give optimum life, and safety in use. 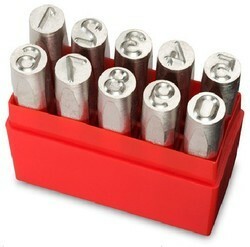 Type can be used in a hand holder (to be hit with a hammer), or, for faster throughput, can be used in a machine holder (to be used in a press). Choice of three different ranges, each with it's own blank size. Lowstress available for applications that dictate that lower stress levels are introduced into the component being marked. Can be purchased as a complete kit, or as single pieces and holders Kits supplied in a strong plastic case with components for accurate storage and easy character selection. 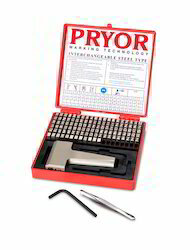 For guidance on hardness of material to be marked, click here. Safety note – as with all hand tools, we recommend the use of appropriate safety protection. Safety glasses and gloves should be used at all times.